Successfully Added HK Warehouse Gretel A7 Android Phone - Android 6.0 OS, Gorilla Glass, 4.7 Inch Screen, MT6580 CPU, Dual SIM, 2000mAh (Silver) to your Shopping Cart. 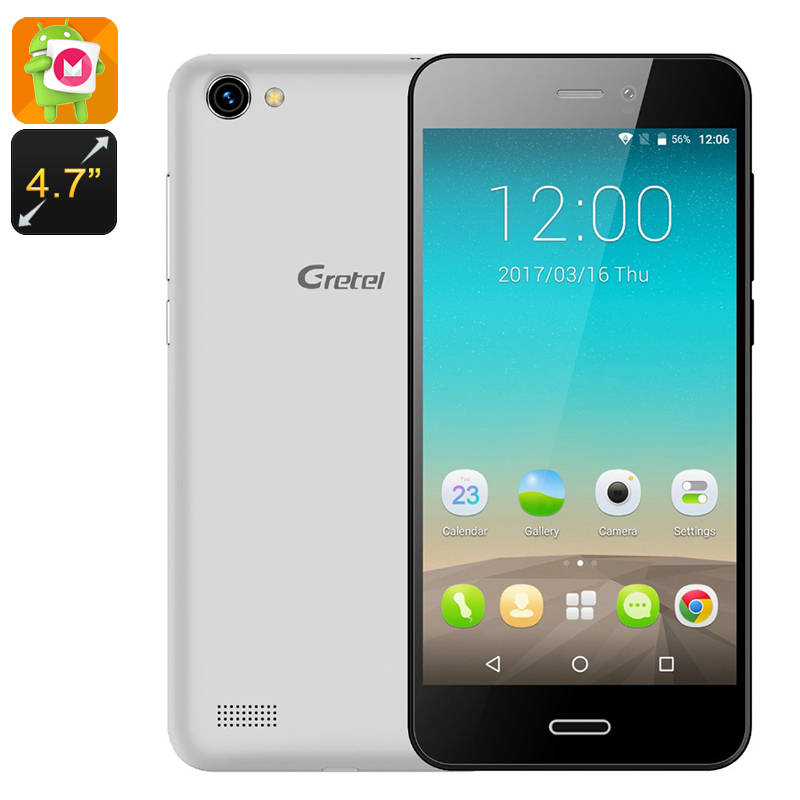 The Gretel A7 is a cheap Android phone with sophisticated specifications. This smartphone runs on the Android 6.0 operating system, thus bringing along a smooth user experience. On the 4.7-Inch display of this Android smartphone, you can enjoy HD resolutions. It additionally features Gorilla Glass thanks to which it is extremely durable. Treating you with 300DPI, this Android phone is sure to deliver a stunning visual experience. If you are looking for a powerful yet affordable Android smartphone, this is the ultimate choice. With its 2 IMEI numbers, the Gretel A7 Android phone brings along great connectivity. From now on you’ll always be reachable on two phone numbers and can be connected to two network providers at once. The next time you head out, you can be guaranteed you’ll always be within reach for friends and family. Additionally, this Android phone also supports 3G connectivity. Thanks to this, you’ll always be able to browse the web on the go. A decent Quad-Core CPU brings along plenty of power to enjoy Android applications. Along with the Mali-400 GPU, you will always be treated with great detail and color. Watching movies and playing games on the go has never been more convenient thanks to this affordable Android phone. The smartphone packs 16GB of internal storage and supports a 32GB SD card slot. With all this storage capacity at hand, you’ll have enough space to store all your downloaded files and media alike. A large 2000mAh battery treats you with 5 hours of continuous usage time. With this power, theAndroid phone will get you through the most demanding of smartphone days. At its back, this Android phone holds an 8MP camera. By allowing you to shoot great pictures and smooth video, this smartphone makes sure all those special upcoming moments will never be forgotten again. This Android phone will always be at your side to snap stunning photographs that can later be shared with all your friends and family. I use 2 weeks, it is very happy. Delivered for 3 weeks to Ukraine. For their money, an excellent device. The battery is warmed up a little at intensive use. A very sensitive screen sensor - you need to get used to it. The 8 MP camera - really gives 7-8 MP. Audibility is good, VatsApp and Vayber, Skype - everything becomes without problems. In general, I am pleased. Доставили за 3 недели в Украину. За свои деньги-отличный аппарат. Немного греется батарея при интенсивном использовании. Очень чувствительный сенсор экрана - нужно привыкнуть. Камера 8 МП - реально дает 7-8 МП. Слышимость хорошая, ВатсАпп и Вайбер, скайп - все становится без проблем.